Crude oil prices picked up a strong bid yesterday after Saudi Arabia's Oil Minister said that said the kingdom will reduce output to 10.2 million barrels per day this month, down about 900,000 bpd from the record high registered in November. Furthermore, the optimism generated by the US-China trade talks and the risk-on bias in the equities added to the bullish tone around oil prices. 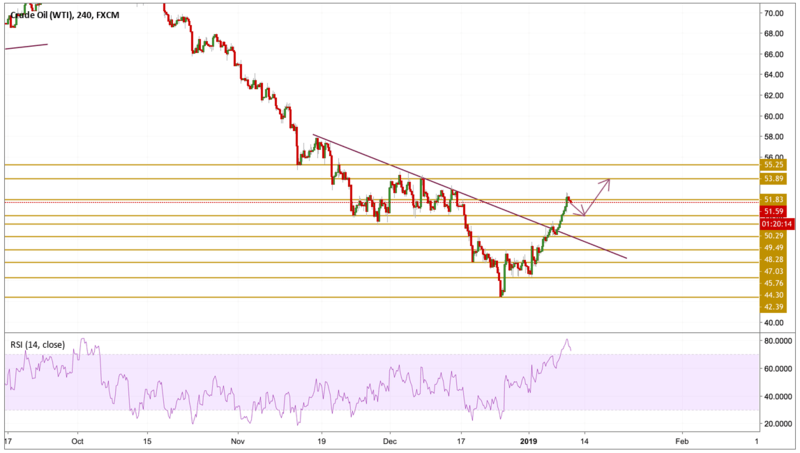 Despite that the EIA report printing above expectations, the black gold is still holding firm above the $50 level and looking to extend its run. As expected, Crude prices surged and broke above the $50 level after penetrating the trend line presented on the chart. The price is currently holding firm above the $50 level and hovering below just below the $51.83 resistance level after reaching a high of 52.56 by surging more than 5%. The RSI points towards extreme overbought conditions, so if we want to see another run, the price must correct a little bit towards near support levels above the $50 level and then we will be focusing on the $53.89 level.